As November winds down and brings NaNoWriMo to a close, it’s time to discuss an important subject that many writers face but don’t like to talk about: writer burnout. All of us have or will come across this dreaded feeling; it’s akin to a sailor being stranded in the doldrums. One minute you’re flying along on the giddy wings of inspiration, and your fingers can’t keep pace with your ideas. The next, you stumble and stare at a blank page. What was effortless a second ago is now a drudge. The words are there, but they jumble inside your mind and they won’t come out. Is it writer’s block or are you tired? This happens to us all. It’s unexpected, it’s not preventable, it’s frustrating and there is no way of knowing how long it’s going to last. The only cure is patience. Writer burnout can strike anyone at any time. So what can you do when it happens to you? We’ve talked a lot about how to use strategies to overcome writer’s block, but burnout is different. The definition of burnout is: “physical or mental collapse caused by overwork or stress.” It’s important to identify the events or times in your life in which you may be suffering high amounts of stress that could contribute to sudden and unexpected burnout. NaNoWriMo is a big culprit. The holidays are another. Tests, exam dates, family visiting, changes to a schedule … these are all valid reasons that one might suffer burnout, especially at this time of year. But writing is how I combat stress in my life, you might say. I agree, as writers do. It can be a cathartic outlet and is a form of stress relief. So why then would one be burned out from doing the thing they love? It is when there is a schedule involved, such as writing for a deadline, editing a project, contributing to a literary journal, composing an academic paper, contributing to a competition or hosting a blog which one might find pressure building. This brings a different sort of expectation to the writing than one would have in writing for pleasure. Typically, writers take pride in their skill and they are so at ease in their craft that they are writing far more than they realize. They may craft a paper for school and discount that as “writing” because it was so easy for them. They may put out a quick blog post but not consider that “real writing.” Then when they come home to work on their novel, they don’t realize that they have been using their talents all day. It may not seem like much, and it may be enjoyable, but it is still writing and requires work. When we are under stress from different areas of our life, the words dry up and we are left wondering if they will ever return. 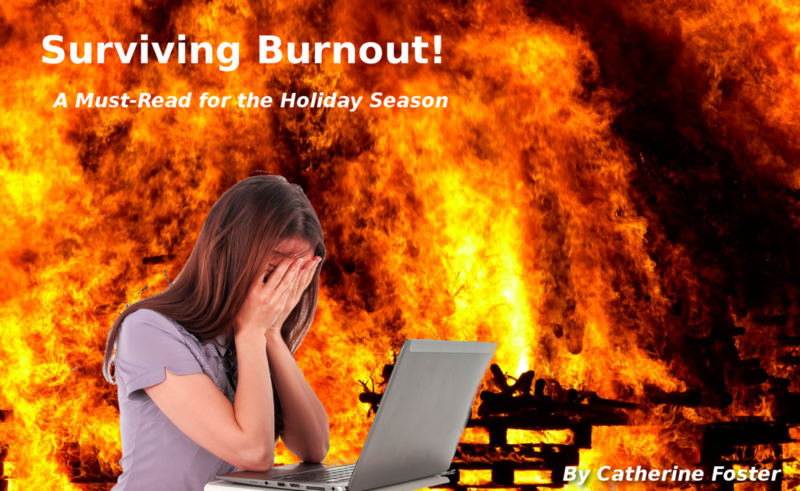 A big contributor to burnout is the holiday season. Whether you love it or hate it, it is tough on the life of a writer. Most cultures celebrate holidays of some kind, and no matter what time of year they fall, they tend to involve a disruption of schedule. Writers need time to practice their craft, and they require uninterrupted concentration. This is in short supply when relatives are visiting and the flow of the day is different due to celebration. Increased responsibility and attendance at festivities means that writing needs to take a backseat to whatever event—or events—are occurring. These events could be a day or even span the course of several weeks. Some families are accepting and accommodating of writers’ needs during this time, and others are less so. This can lead to frustration and guilt for the writer. This slurry of disrupted scheduling and emotional havoc is a major contributor to burnout. What can be done? Be patient and forgiving of yourself, especially during a time of year when you expect to have increased responsibilities that will take away from your writing time. Plan when you can write and set aside those moments so that you can be assured to have time for yourself in the chaos of the holiday season, but know, too, that you might not be able to keep to your regular output. Understanding that beforehand will alleviate anxiety. Many people who participated in NaNoWriMo choose to take off the month of December. A pause is something to consider, and know that you may come back in January invigorated and refreshed. Understanding that burnout doesn’t just happen to some—it happens to all—is a helpful point to remember. This is something that is stress-induced and can be managed, but in the end every writer has been in this position, and you are not alone. From Shakespeare to Virgina Woolf, if you wield a pen, at some point you will feel betrayed by your inspiration. It’s the badge that marks you as an author, and something only time and patience can cure. But by keeping in mind that you are in good company and you, too, will survive, hopefully your holidays will be a little less stressful to begin with.